Sustainability, harmonious farming and a true paddock to plate philiosophy The Farm at Byron Bay fosters a community of likeminded growers and producers who share the motto of grow, feed and educate. Spread over 80 acres of land near the popular beachside town of Byron Bay in Northern New South Wales, the working farm makes the most of the regions rich fertile soul and generous weather to grow a wide range of produce and flowers while opening its doors to the public to enjoy the farming experience. Three types of animals are farmed on the land – poultry, pigs and beef cattle – and the animals enjoy free range living, free to roam as much as possible while being nurtured and fed on a varied, natural diet. The Farm is also 100% chemical and spray free with a focus on more traditional and sustainable farming methods. On-site there is a collection of micro businesses including Produce Store, The Bread Social, The Garden Shed and Three Blue Ducks Restaurant, which make use of the abundance of produce grown on site and in the local region. The Farm is a great place to bring children with school holiday activities and programs, birthday parties and kids farm tours available. Dogs (on leash) are also welcome making it a great day out for furry friends. 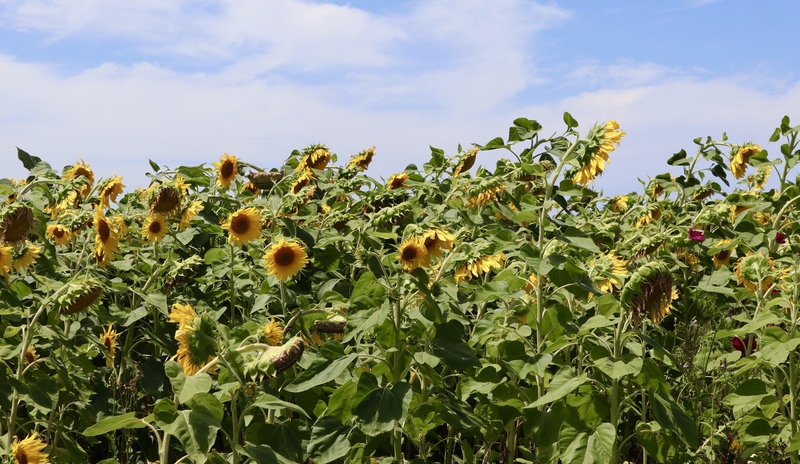 Beautiful flowers are grown in the paddocks with one highlight being a field of sunflowers that has paths meandering through it which are wonderful for both kids and adults to explore. It is a great educational experience also with children able to see and learn how food is produced. While weekends and holidays can get busy, because of the vast amount of land to roam it never feels too crowded. The Farm is open 7 days a week with farm tours operating on Saturdays and Sundays. For more information including opening hours visit The Farm website here. Love farms and country life? Click here for a beautiful Peony Flower Farm and here for a Swiss Italian Lavender Farm. This has gone on my list of places to visit for next year when we’ll be in Byron Bay – thanks for the tip. Definitely visit, it is a great day out! Love the flowers and sunshine. Deep winter here. Blessings! You mention that this place plays home to “a community of likeminded growers and producers”. You wouldn’t happen to know if those include the well known Byron Bay Chilli Co. by any chance, would you? Hi, I didn’t see them there, however there were a number of products in the Produce Store so they may have products stocked in the store, I’ll definitely check next time!